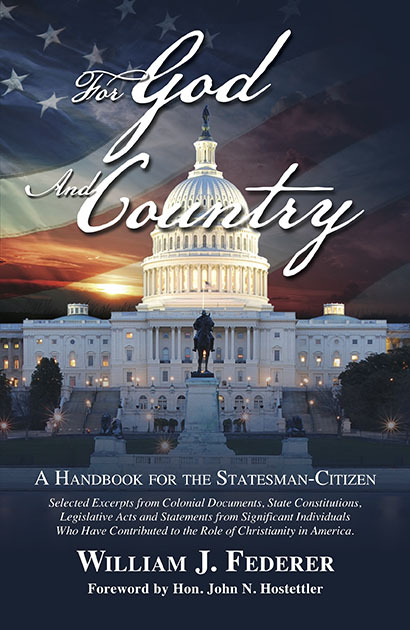 William J. Federer noted author and speaker on America’s noble heritage, has now written a handbook for the Statesman-Citizen. For God and Country seeks to re-introduce the “memory” of our nation’s past, particularly with regards to the role of Christianity. Included are excerpts from various original charters and founding documents of each of the 13 colonies, the 50 state constitutions, significant treaties and court decisions, and past presidents’ inaugural addresses. It is hoped that by refreshing our national memory, we can gain insight which will help us successfully solve current questions and challenges.